Our story is about connection. God connecting the right people to the right places at the right time. In 1992 a Kenyan church worship leader introduced our Executive Director, Mary Kamau (then a college student), to his former home on the streets of Nairobi. This visit to Mathare Valley profoundly affected Mary’s life and inspired MOHI’s future work. Around the same time, Wallace Kamau, Mary’s future husband and co-founder of MOHI, also felt led to minister in Mathare Valley as a college student. As the Kamaus completed their education, God continued weaving His story for the people of Mathare Valley into their hearts. Mary completed her degree and began working with various organizations serving children, including a church in Mathare. Likewise Wallace started ministering to churches in Mathare apart from his career as an accountant for PwC. The couple met at a prayer meeting in 1994 and married the following year. They started talking about long-term ministry to families in Mathare. From their own volunteer experiences, they knew what didn’t work, so-called “hit and run” efforts that provided temporary services but no lasting commitment to the community. Like revival meetings where hundreds of people would dedicate their lives to Christ but without any continued discipleship or connection with local churches. Or organizations that would teach community members about sanitation, clean water, and basic hygiene, only to leave a few weeks later. They also recognized the type of ministry that would work best: Reaching children as an entry point into families, then the community, to bring about lasting, holistic transformation. Out of these connections, Missions of Hope International was formed. We’ve grown from serving 50 children in one section of the slums to more than 16,000 children in 23 different communities throughout Kenya. Our schools are holistic resource centers that provide a quality education, basic health care, job skills training, microfinance loans, counseling and other services. We continue to connect with the right people, as churches and other organizations join in our work. And the right places, as we have expanded to remote, rural communities where access to education and job opportunities are extremely limited. And in the right time, as God grows our programs to serve more people. Be part of our story: Connect with us to transform Kenya for God’s glory! 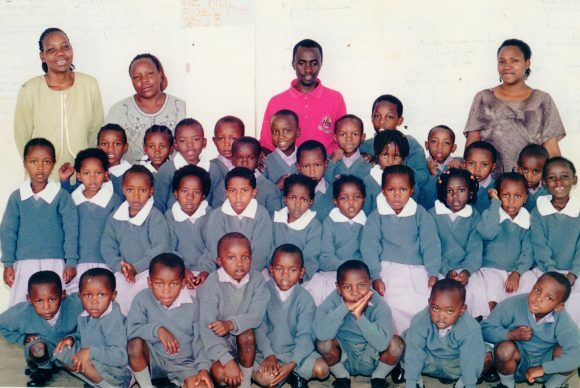 In 2000, we began a school in a Mathare village for 50 of the most desperate children, ages four and five. Along with a quality education, Mary conducted home visits with each family, sharing Christ’s love and offering guidance for healthier homes. The number of children enrolled in our school grew to 140. Even more students were put on the waiting list to join school because we didn’t have available resources to accommodate them. We started a community health evangelism (CHE) program to reach community members with the Gospel, accompanied by lessons on disease prevention and healthy homes. American missionaries from CMF International visited our organization to learn more about our CHE program. This relationship developed into a formal partnership between MOHI and CMF. With the help of an American volunteer, we started a sponsorship program to enroll more kids in school. God also provided funds to buy land for a future boarding school in Joska, approximately 24 miles outside Nairobi. This would give our older children (including the first 50) a safe environment to continue their education and experience life outside the slums. Because of our rapid growth, we needed a new space for our offices and a bigger school. As we raised funds for a new building, the slum community displayed overwhelming support by contributing more than $4,000 USD! Ministry partners assisted in supplying the rest of the funds to purchase and build our Pangani center, home base for MOHI. The needs around us also continued to grow. A small notebook contained the names of children on the waiting list who anticipated joining school– page after page of children in desperate need, longing for an education. When a visiting American pastor saw the list, God touched his heart about this need. He recorded a video of the lengthy list of names in the notebook to show his congregation at home. His home congregation then sponsored 470 children! Given the huge number of sponsorships, CMF began running our sponsorship program. All of the children on the waiting list were sponsored! The additional funding from sponsorship allowed us to open school centers in other parts of the slum to educate even more kids. Churches started sending short-term mission teams and also “adopted” communities within the slums to work alongside us. We began construction of a new boarding school in Joska. On September 3, 2007, a group of 203 children from 4th through 6th grade transferred to our new Joska center. Children from the surrounding community were invited to enroll in our school, which was closer than walking many miles to a government school. 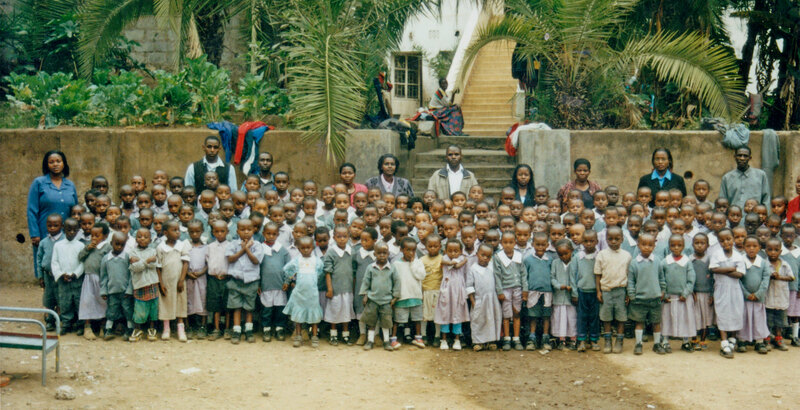 37 of the first 50 children to join MOHI in 2000 took their national exams to attend high school. Two students earned exemplary scores to join a prestigious national high school in Nairobi. The other students also secured positions in high schools throughout Kenya. We started a high school at Joska with approximately 200 students (boys and girls). This was a huge step in assuring that MOHI students could attend both primary and secondary schools and potentially go on to university. We started a job skills training program for parents of our students and other community members to better support their families. The sale of their hand-crafted products also provided new ways to sustain our ministries. Recognizing the need for increased mentorship and personal growth for our students, we started a boys high school in Ndovoini, a few miles from our Joska center. We expanded MOHI to northwestern Kenya in Turkana county, an extremely impoverished region with limited schools and employment opportunities. We recruited children from the Napuu area for a new school center. Currently, our Napuu school center educates more than 700 students. At the end of the year, our first 50 students took their national exams for completion of high school. More than 20 students attained sufficient scores to attend university, with one student scoring straight A’s in high school! For the first time, we partnered with the Kenyan government to enhance the educational programs of two government schools– Kangagetei and Napusimoru– in remote Turkana communities. In addition to child sponsorship, a key component was implementing more comprehensive feeding programs at the schools to alleviate severe droughts that often affect the area. The Kenyan government upgraded our Joska clinic to a full-service healthcare center. This allowed us to offer comprehensive in-patient and out-patient services to kids and staff at the school and members of the Joska community and surrounding areas. We took control of an existing school and established a new MOHI center in Bura, a predominantly Muslim community in northeastern Kenya. Like all our schools, the center provides an entry point to families and the community to share Christ’s love. We also founded a new center, Kargi, in Marsabit County in northern Kenya. 2017 was a year of growth. We added more than 1,700 new students, had 13 centers undergo construction projects and grew our skills training program to impact more than ever through new skills like computers and carpentry. A strategic partnership started with Salix, an American data entry company, to train and hire select MOHI graduates. We also launched Ignite, a monthly youth conference for our middle school students and their friends.